I found this attached illustration of Moses Harris on the internet. It was painted by Alfred Jacob Miller in 1837 (I think that was the year) This is a black and white rendition of Millers portrait. I've seen colored ones , but I don't know what website I'd found the colored painting. Harris died before photography became popular, so unlike Jim Beckwourth, Moses Harris' photo was never taken. The stories that I sent to you written by Matthew Field are at the Missouri Historical Society among the Sublette papers. Those were stories told to Field by Harris and Sublette themselves. 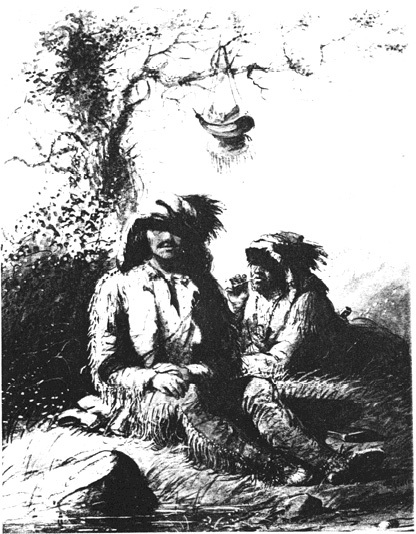 I don't know of any publication that contains those Field stories, however there is a book titled PONDER THE PATH (1808-1830) that tells the story of Sublette and Harris' trek from the Rockies to St. Louis in January of 1827. It was written using historical documents, but it isn't a primary source as Field's diary is. Wind screeched through the cracks in the [Cache Valley, Utah] cabin wall, as [William] Sublette confided, "Under our contract, General Ashley has to supply S, J & S [Smith, Jackson & Sublette] with goods for the July 1, 1827 Rendezvous, if we put the list of our needs in his hand by March 1, 1827. I never counted on this blizzard. S, J & S'll fer sure go busted if I cain't make it to St. Louie in 90 days." Moses Harris grinned, "Mus' be 1200 mile. Take dat 90 days on horseback to make it in good weathah." to St. Louie with me on snow shoes?" "Is pigs uglier dan us? Gonna load all I kin on dat pack dog o' yers. We boaf haul all we kin, we might kin git dere in time." By noon Sublette, Moses and the pack dog Pony were bucking icy gales east through the mountains. With his heavy pack Pony's huge feet sank deep in the snow. They expected to find buffalo around Ham's Fork, but ate jerky instead, diving for cover from hunting Indians that barely missed Pony with any arrow. They reached Independence Rock about the middle of January. While Moses skinned the buffalo he'd downed, Pony brought a winter hare to Sublette. When Moses came with fresh buffalo meat steaming in the cold, Sublette gave the rabbit back to Pony. After a brutally cold night they packed all the buffalo they could carry and let Pony gnaw the frozen carcass till they staggered away in the snow. Moses and Sublette took turns breaking trail in the crackling cold. They stumbled onto the frozen North Platte, then wallowed through low hills to Ash Hollow. After trying to dodge Pawnee sign, they fell into friendly Big Elk's camp. The Indians shared what they had, then sent them into the dawn. Just past Cold Camp Creek, they met a small band of Indians. Sublette traded a hunting knife for a buffalo tongue. He tried to give part of the tongue to Pony, but the once mighty animal had fallen weak and listless. Sublette moved the sugar and coffee from Pony's pack to his own, hoping Pony'd get his strength back. At Grand Island, Sublette shot a raven, but he and Moses were so hungry they wolfed it down raw. Pony ignored his piece of the gaunt bird to lick his own raw feet. Fifty miles further, Sublette and Moses got too feeble to walk, collapsing under three trees frozen together like the folds in a lady's fan. At dawn Moses knew he'd die if he didn't eat. He shook Sublette awake. "We gotta eat yo dog or die." "Cain't eat Pony, " Sublette sprayed through bleeding lips. "We dyin'. Gotta eat," Moses rasped as the wind blew a shawl of frost across the black man's face, turning it white as glistening salt. Sublette knew Mose was a man among men. He couldn't let him die. "I'll do it Mose. He might turn on you." Sublette's huge hands closed around Pony's throat. The wolf-dog's yellow eyes went glassy. Pony coughed but did not fight for life. A vision of [his brother] Milton bounding through a field of spring flowers with [beloved hound] Seneca blinded William. "Milton must never know what we done here," Sublette sobbed. His own tears freezing to his face, Moses lunged to grab the dying dog's throat. "Dis is killin' you, Bill. I'm gonna say I done it." But Moses collapsed, and Sublette squeezed until his beloved Pony lay still in his great hands. Harris worked along side of and for William Sublette, so you'll probably see refernces to him in this history which does mention the black man named Edward Rose. "Jedediah's unwavering eyes froze to blue ice. He generated a knife-thin smile, "Major Henry sent Edward Rose, a mulatto Crow War Chief down here with me." "Rose -- I've heard the name. Major Henry's talked of him like he's some kind of legend. Where is Rose?" "I dunno, but if you ever spent five minutes with Edward Rose, you'd never forget him!" "Rose has the devil's body and the tongue of an angel. Speaks 10 languages. Got his nose slashed as a boy in a brawl on a New Orleans keelboat. Crows he lived with called him Nez Coupe¢ -- Cut Nose -- till he slew five Minnetarees in a battle where he fought the whole tribe alone. Now the Crows call him Chee-ho-carte -- Five Scalps. They worship him as a demon. When Manuel Lisa fired Ed Rose, Major Henry says it took 15 men to hold Rose down long enough for Lisa to get away to St. Louis. And Rose was sober -- he's worse if he's drunk." Now starkly awake, Ashley snapped, "Where is Rose? Gotta keep track of a man who acts like that." "Can't. Rose comes and goes like the vapors." "What good's Rose to us here?" "First time Major Henry ran into Rose was in 1809 -- living in an Arikara village. Speaks their language fluently." "Send Rose to me when he gets here. Set up our shore camp by the river right under the noses of these Arikara villages." "What'll we offer them for their horses, General?" "I'll open with squaw trinkets, blankets, mirrors and vermilion sticks. If those fail, I'll trade powder and shot for horses." Jedediah Smith's jaw dropped in disbelief. "As you say, General. As you say." original trek from Winter Quarters, Nebraska, to the Great Salt Lake Valley. Tribune history writer Harold Schindler, using diaries, letters, journals and reminiscences that have come to light this century, has fleshed out the following narrative. As ox teams strained to haul Camp of Israel wagons toward the saddle that was South Pass in the Wind River Mountains, the pioneers met an eight-man party of mountaineers from Oregon leading a string of twenty packhorses laden with robes, skins and pelts. Many Mormons took the opportunity to write letters to Winter Quarters for the trappers to take with them. The wagon train continued over the summit where Orson Pratt had calculated the altitude of the Continental Divide at that point to be 7,085 feet above sea level. The company proceeded down the west slope to Pacific Springs where Pratt, George A. Smith and John Brown awaited them with Moses "Black" Harris, the celebrated mountaineer. Harris was a monumental figure in the fur trade, despite the fact that so little is known of him. He was a South Carolinian and one of the more famous of William Ashley's "enterprising young men" of the 1820s. The sobriquet "Black"
likely came from the dark hue of his skin. Artist Alfred Jacob Miller described him as a man of wiry form, made up of bone and muscle, with a face apparently composed of tanned leather and whipcord, finished with a particular blue-black tint "as if gunpowder had been burnt into his face." Harris had a reputation for being a raconteur of truly tall tales that rivaled the boastful Jim Beckwourth. George F. Ruxton said, "He was the darndest liar was Black Harris—for lies tumbled out of his mouth like boudins from a buffler's stomach. He was the child as saw the putrefied forest in the Black Hills"—where birds were made of stone. William Clayton thought Harris to be "a man of intelligence and well acquainted with the western country." He had carried along some newspapers and allowed the Mormons to peruse a number of issues of the Oregon Spectator and the first issue of the California Star, this published in Yerba Buena (San Francisco) by no other than Sam Brannan, who took a shipload of church members to the coast aboard the Brooklyn. But Harris gave them a discouraging report of the Salt Lake Valley and environs. The whole region, he said, was sandy and destitute of timber; no vegetation but the wild sage. He gave a better view of the Cache Valley which he said was a fine place to winter cattle. Ah well, sighed Clayton, after so many contradictory reports from various travelers, the Latter-day Saints would just have to see the country for themselves.